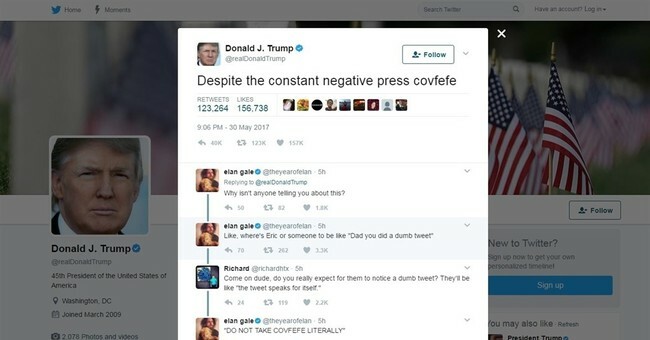 President Donald Trump frequently comes under criticism for tweeting, even from his own advisers. But tweeting is probably the smartest thing he has done as president. He is able to speak directly to the American people without going through the biased mainstream media filter. The media doesn’t get to ask him slanted questions or pick and choose parts of his press releases to publish. Instead, Trump gets immense control over every single sentence he issues, which are then read by millions of Americans. With almost everyone online these days, it is easy for the average American to follow Trump’s tweets on Twitter. Twitter is free, unlike some mainstream media sites. Many of The Washington Post’s articles — the site is a frequent critic of Trump — are behind a paywall. A Twitter account isn’t even required in order to view Trump’s tweets. And even if left-leaning Twitter artificially buries positive news about Trump, it doesn’t matter, people go directly to his tweets. Google, Twitter and Facebook control much of the news we see today, but Trump’s tweets get around their dominance. Similar to the Drudge Report website, Trump’s tweets are so well-known that people view his tweets independently of the tech giants. The Drudge Report receives comparable traffic to Google News and The New York Times — despite the fact Google News prominently promotes the Times in search results and on its homepage. Drudge isn’t even carried in Google News, since the site merely aggregates links to articles. Google is the most trafficked site in the U.S. as well as in the world. Most of the time, Google News is full of articles by the left-leaning media critical of Trump and conservatism. But Trump’s tweets changed all that. Reporters race to report on his tweets, filling up Google News with articles that are far more favorable to Trump, since there is so little room left for spin with his tweets. A quick perusal of Google News right now reveals this headline near the top, “Trump accuses Clinton of colluding with Democrats to defeat ‘Crazy Bernie Sanders.’” The Washington Post article acknowledges, “Trump took to Twitter Sunday morning…” There really is very little way to write the headline to make Trump look bad. There wasn’t any extra information to glean something from outside of one short tweet. One sign of Trump’s success at tweeting may be diminishing references to the Trump campaign’s alleged collusion with Russia to influence the U.S. presidential election. Trump rails on Twitter frequently about the “fake news” media making up his ties to Russia. Although no evidence of collusion has emerged during the months the left-leaning media has made it a top story, the media ran with it for quite a long time. But Trump kept hammering the media over it, never letting up, sometimes with multiple tweets in a row. Finally, after fired FBI Director James Comey told Congress earlier this month that there was no collusion, the media showed signs of backing off. On June 22, CNN retracted a story. Rank-and-file Democrats in Congress are now urging leadership to stop talking about it. Trump’s tweets repeatedly labeling the mainstream media as fake news, combined with banning their journalists from news events or ignoring them at press conferences when they ask questions, is gradually chipping away at their dominance. Trump attacks CNN probably more than any other news site. Its website traffic has gradually decreased over the past year. In contrast, Breitbart, which is considered by some to be the number one pro-Trump news site, saw a steep increase in traffic right before Trump became president, which has remained at that level. Unlike CNN, Breitbart does not receive top favorable placement by Google News. Trump’s advisers continue to pressure him to stop tweeting. They are concerned that without a filter, he may tweet something reckless that could harm him. But so far he’s tweeted several things that critics contend were terrible — yet they bounced right off of him. When Trump tweets things that seem inaccurate, he generally clarifies or corrects them later. Critics are exaggerating the negative aspects of his tweets. But the public has the ability to read his tweets unfiltered and can see through the spin. Additionally, it helps that Trump is funny. He’s spent years in entertainment and knows how to drop clever one-liners. He keeps people engaged and coming back. His tweets often receive over 100,000 likes. Consequently, Trump is still fairly well-liked — despite misleading approval polls — which contributed to his ability to accomplish more during his first 100 days in office than any previous president since World War II. Trump tweeted in 2013, “Sorry losers and haters, but my I.Q. is one of the highest -and you all know it! Please don't feel so stupid or insecure, it's not your fault.” It may have been arrogant, but his success with Twitter has proven his tweeting is sheer genius. He will go down in history as the president who figured out how to get around much of the biased media and talk 24/7 directly to the American people.